We have just spent 2 lessons on Trigonometry and here is the writeup as promised. You were getting everything right but these notes are in case you forget a small step and need to revise. So anyway we were just using the SINE RULE and CROSS SUMS to find the missing side or the missing angle. Finding an unknown side, given a right angled triangle, with one known side and one known angle. 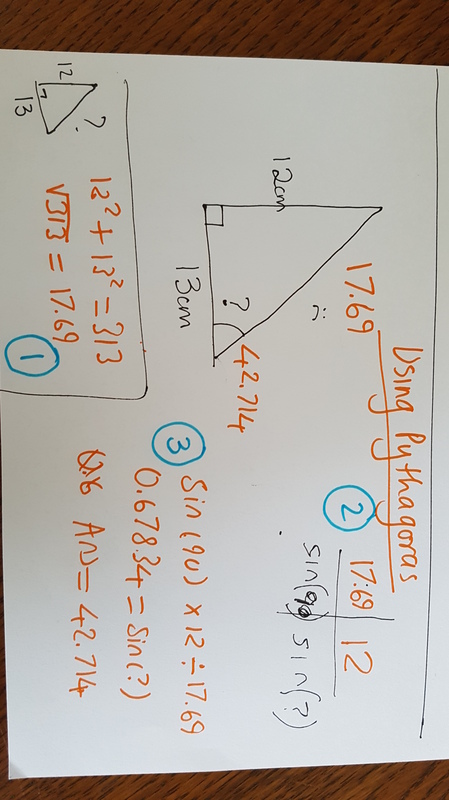 Finding an unknown angle given a right angled triangle, with two known sides. If the Hypotenuse is unknown you will have to use PYTHAGORAS’ Theorem to find it, first. This time the cross sum’s answer will be weird (0.67834 in the example below) and you need to write sin(? )= 0.67834 or whatever. Write the answer onto the diagram and check it looks reasonable. If the hypotenuse and one other side is given, then you wont need Pythagoras. So its easier.